Football season is almost here! Growing up with three older brothers and a dad who were all rabid sports fans, I always smile when I hear the Monday Night Football theme, a college band playing their fight song, or watch the crowds begin to gather for our local team (Go Niners!) home games. That means I have the perfect excuse to make tailgating food – either at the game or at home. Tailgating doesn’t have to be limited to just the stadium parking lot. Why not set up a party with your neighbors? You can all set up chairs outside and start the party in advance of the game, grilling delicious foods together, then head indoors to watch the game. You can have nearly the same experience as if you were at the stadium. Did you know that tailgating has been around a lot longer than the old family station wagon. Town folks gathered to watch battles during the Civil War and the western chuck wagon provided the same type of outdoor cooking over live fire as we have with barbecues – just a little more rustic. We still crave the flavors of meats cooked over fire and why pillars of smoke fill the parking lot for hours before game time. The foods people serve while tailgating run the gamut from cheap and easy to high end and fancy. Some people bring pre-made sandwiches, others prepare entire meals in the parking lot. No matter how you plan to celebrate, make sure that all your foods are kept cold enough to be safe. I love big, fat, messy sandwiches jammed with grilled meats and slathered with sauces. Steak is one of my favorites, but high-end cuts are too expensive to make for a large crowd. When I am hosting the gang, I turn to cuts like Chateaubriand and London Broil to save money and give everyone the beef they crave. Chateaubriand is more tender, but both make great options for sandwiches. 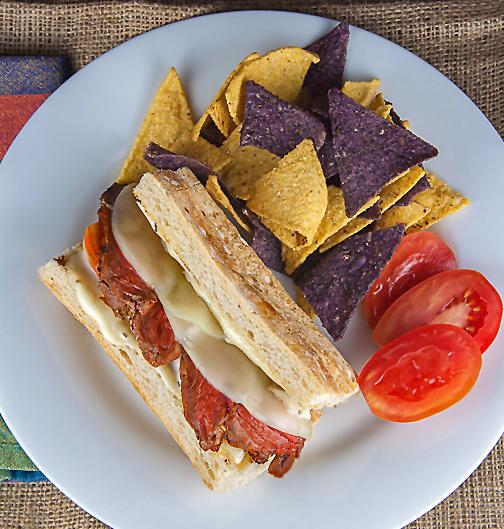 Today’s sandwiches are the perfect meal for your football parties, whether at the stadium or at home – and have the added benefit of being completely gluten-free (as long as you use gluten-free bread), for those with dietary concerns. Enjoy! Use a good cutting board with a moat to catch the juices. I like Epicurean boards and have several. I got the big one just for carving roasts, chickens, and turkeys. They are two-sided giving you even more cutting area. To keep it from sliding around while you’re working, lay a square or strip of shelf liner underneath it. The board won’t move at all! And use a very sharp carving knife or slicer for easily cutting the thinnest slices. Use a gluten-free roll, slices of bread, or a couple of lettuce leaves as a wrap. If you are using the lettuce, melt the cheese over slices of beef on a baking sheet and then wrap right before serving. Make Horseradish Mayonnaise: In a small bowl, whisk together the mayonnaise, horseradish, and garlic powder until smooth. Cover and refrigerate. Marinate Beef: In a medium bowl, combine all the marinade ingredients. Whisk together until smooth and pour into a large resealable plastic bag. Add the beef to the bag, press out the air, and seal shut. Flip the bag a few times to get all surfaces of the meat coated. Lay flat on a small baking sheet and refrigerate. Leave to marinate for several hours or up to 1 to 2 days, flipping the bag several times to make sure all sides of the meat are submerged in the marinade. Grill the Beef: Preheat your gas grill for 15 minutes on high or build a hot charcoal fire. If you have multiple burners, you only need one lit. The rest can be left off. Use the tongs to remove the meat from the marinade and transfer to a paper towel-lined baking sheet, using extra paper towels to pat the entire roast dry on all sides. This will help you get a good sear on all sides without steaming the beef. Discard the marinade. Use the tongs to place the meat on the grill over direct heat. (After placing the raw meat on the grill, wash the tongs to avoid any cross contamination.) Reduce the temperature to medium high and cook about 4 to 5 minutes per side or until you have nice grill marks and an instant read thermometer registers 130°F-135°F for medium rare. If the meat sticks to the grill when you try to flip to the second side, let it cook a minute or two longer. It will release easily when it is ready to flip. Don't worry about taking the meat off the heat while still underdone. It will continue to cook while it is resting so pull it earlier for perfect level of doneness. Transfer the beef to a clean baking sheet, cover loosely with aluminum foil and let rest about 15 minutes. This gives the meat time to gently finish cooking with the residual heat, allowing the juices to redistribute throughout the roast. Leave the grill on. Grill the buns. Lightly brush the cut sides of each roll with butter and place them butter-side-down on the hot grill. Cook just until the bread is lightly toasted and has some grill marks. Remove from the grill. Reduce the grill heat to medium low. Assemble Sandwiches: Transfer the beef to a cutting board and slice thinly on the diagonal against the grain. Brush the buns with the horseradish mayonnaise (if desired). Add some tomatoes if you like. Place several slices of beef on the bottom half of each roll, overlapping them slightly. Top with the cheese and place back on the grill, over one of the cooler burners or on the rack above the grates for gentle heat. Close the grill and heat until the cheese melts. Use a spatula to transfer the hot sandwiches to serving plates. Place the tops on the sandwiches and serve immediately. This recipe is part of Food Network’s weekly Summer Soiree celebration. See the links below for inspiration and great recipes and check out our Pinterest page for even more! Let’s connect! If you ever need any entertaining or cooking advice, need to alter a recipe for gluten-free, or want recipe suggestions, don’t hesitate to email me. I can also be found at the social media site links on the right. Thanks for joining the Heritage Cook Family! Unauthorized use, distribution, and/or duplication of proprietary material from The Heritage Cook without prior approval is prohibited. This includes copying and reprinting content and photographs. If you have any questions or would like permission, I can be contacted here. Feel free to quote me, just give credit where credit is due, link to the recipe, and please send people to my website. The suggestions here are not intended as dietary advice or as a substitute for consulting a dietician, physician, or other medical professional. It is the reader’s sole responsibility to determine which foods are appropriate and safe for their family to consume. The author makes no claims regarding the presence of food allergens and disclaims all liability in connection with the use of this site. Please see the Disclaimers page for additional details.